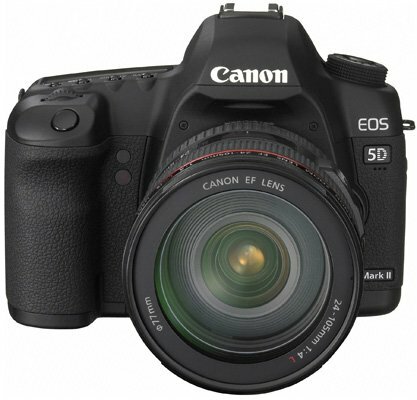 Review Back in 2005, the EOS 5D digital SLR marked the best way into full frame (24x36mm) shooting for Canon owners. Optically, this model was on a par with 35mm cameras of old. With a sensor this size, finally, here was a way of getting the original focal length of your old 28mm lens back from the scaling beyond 40mm that occurs when used with smaller sensor cameras. Four years on and the Canon EOS 5D Mark II incarnation notches up an impressive array of features. It’s now blessed with a fantastic 21.1Mp sensor – the same count as the EOS 1Ds Mark III – but improved still further with greater sensitivity in the ISO settings and its DIGIC 4 image processor. It now has rapid fire shooting at 3.9f/s, a bigger screen on the back, an upgraded battery, AF micro-adjustment, Highlight Tone Priority, Auto Lighting Optimizer, vignetting correction and Live View – real time LCD panel viewing – plus an HDMI output and support for quick UDMA CF cards. 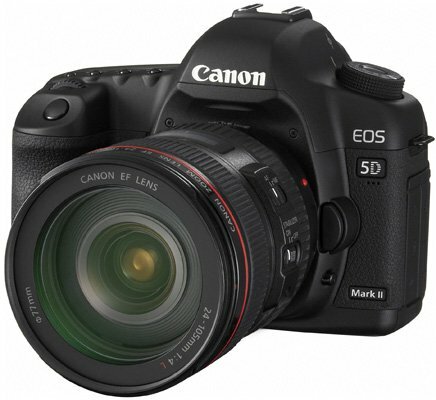 The 5D MkII also offers excellent customisation and expanded menus. All the things you would expect would make jobbing semi-pro, wedding and portraiture photographers beg to upgrade. And then Canon adds the daddy of all headline grabbers, 1080p video. So let’s get this out of the way first. Canon cannot plead surprise that the world has taken more than a keen interest in this 'other' feature. Now had it just done 640x480 or even 1280x720 at 30fps, like most video functions on stills cameras, smaller interest would have been paid to this particular feature. Canon must have known that 'indie' filmmakers would wet themselves for the filmic look of using quality glass in front of a full-frame, CMOS 35mm sensor. The point being, the size of the light grabbing. Billed originally as a great tool for the news gathering crowd – even phone video resolutions are making their way onto the ten o'clock news – but this is HD video at 30fps! A little overkill for that. Admittedly, it is in H.264, a codec that is very much about playout from the device, and not for ideal for your average non-linear editor. The upside is, H.264 video is comparatively light on card space.